It has been a crazy-busy April as the Mendiolables enjoyed travelling from Manila, to Laguna, to Batangas and to Baguio as we toured my sister-in-law and her kids. More than any one, my husband is the most tired because he's the sole captain and drove from all the places mentioned. John's body ached so much so we headed in The Spa of View Park Hotel in Tagaytay for a whole body massage. Since Mother's Day is near, View Park Hotel brings a complete Mother's Day Off wellness package for Php 499 only where moms get 1 hour of whole body massage, foot soak and facial mask with FREE signature Siglo Turmeric Tea. 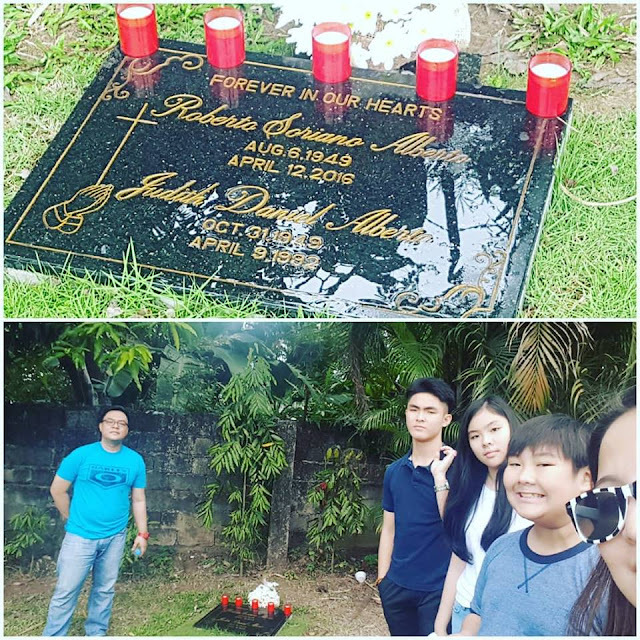 Reserve a slot for your mother, mom, mommy, mudra, inay, nanay, mama, mamang. Call 0932 534 6090 for booking and reservation. or you may email at inquiry@viewparkhotel.com. We go to the City of Pines at least once a year but we don't get to go to Baguio Night Market because we usually stay in the hotel or visit SM after dinner. This Baguio 2018 trip is for Gabe and Meeca and their most important itinerary was to buy stuff. So we headed at Harrison Road, near Burnham Park, before 9am. We were too early because the selling starts at 9:00 in the evening and closes until around 2:00 am. The crowd built up earlier than when we arrived because it is a shopping Mecca where people from all walks of life haggles for items like shoes, dresses, shirts, toys and more. This "ukay-ukay" street is not only for late night thrifting but also a street food haven. You will never get hungry because lugaw, kwek-kwek and other food abound. I'm happy for my first ever Baguio Night Market experience because I got to meet artist Nadz Barcasio and bought a bag from him. He gave me a necklace token. Juan bought 4 pieces of small stuffed toys for only 100. Meeca, Julia and Gabe bought clothes. Rafael is the happiest because he found Kobe 10. It was selling for 3,200. I haggled for my son and got it for only P2,500. I have been invited before to visit and stay at Azalea Residences in Baguio along with other bloggers. It was actually a nice invite because everything is paid for, including the trips in other tourist spots in Baguio. I begged off with the invites because traveling to Baguio or any other places means spending it with my family - The #Mendiolables. I bought this De Luxe Room Overnight Accommodation online to a female blogger. So, what can I say about Azalea Baguio? 3. Front liners are efficient, accommodating and well-mannered. Special mention goes to Aaron. 5. The Room has a balcony with great view of the hotel's frontage. 6. Buffet breakfast has different choices from rice eater to non-rice eater. 7. The Supervisor was kind enough to serve Julia's food in the room since she's is a late-riser and was not able to join us for breakfast. 8. Wi-fi is fast with no limit as to the number of users. 9. Hot and Cold water dispenser is provided for every floor so we didn't have to buy at the grocery. 10. The place is near Teachers Camp, Camp John Hay, Burnham Park, The Mansion, Botanical Garden and Mines View Park. 1. When we opened the door of the room, something bad -smelling came out. I called the room service and he brought a Lysol spray. I asked if he can leave the spray so we do not have to call back again if the smell persists. The guy said no because they need to use it for the other rooms. An hour after spraying the Lysol, the smell persisted so I just used my perfume to freshen the room. 2. There was a loud noise coming from the tent. I called the reception area and asked if they have an event going on. There was a private company event happening at the tent. There was a loud sound coming from the speakers being used. The smoke of their BBQ grill reached our room (which made us really hungry, lol!). We were able to tolerate the BBQ smoke but not the loud sound (which you can hear while I was shooting for this vlog). We we were not able to sleep in the afternoon because of the loud sound. Despite the two mentioned things we disliked, Azalea Residences in Baguio is actually a nice place if you plan to stay in Baguio. The room has a kitchen so you can cook fresh veggies bought at a nearby market. They also have a play area for the kids to enjoy. The Dominican Hill Retreat House, also commonly known as the Diplomat Hotel, is an abandoned structure and a reportedly haunted place atop Dominican Hill, Baguio. We've been in this place a couple of times and I'm amazed that it is now rehabilitated and has been renamed as the Dominican Heritage Hill and Nature Park. My husband is very choosy when it comes to food and people so when we travel I take into consideration the people we will tag along and the food we will eat. For our 2018 Baguio Trip, John didn't ask for anything but he kept on telling about Chef Didier's Table with his sister, Ate Gaye. As a dutiful wife, I made a rush booking with Merna (wife of Chef Didier), for an overnight stay with breakfast. Don't do what I did. If you want to experience Chef Didier's food at its best, consult them by calling at 0921 572 8408, or message Chef Didier's Table in Facebook or you won't be accpeted because they only buy and cook the freshest ingredients. If you're particular about the aesthetics, this is not the place for you because this is a simple house. The place is a bit far from the commercial center, located at 134 Upper Loakan Road, Liwanag Subd., Baguio City. We, the #Mendiolables though love the warm accommodation, the endless talk about life, family and food with Chef Didier and Merna. More than the facade, Chef Didier's place is about great food and great company. 4. 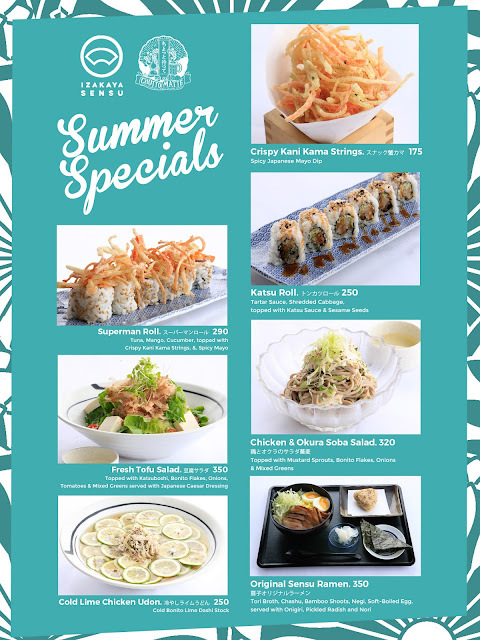 Lunch and dinner starts at P249 up to 399 per person for in house guest only (minimum 4 pax). 5. If you prefer to stay at Chef Didier, overnight accommodation is P500/person with Filipino breakfast and P600/person with international breakfast. 6. They also offer more elaborate menus and works around the clients' budget as well as dietary preferences. 7. At least 36 hours minimum advance reservation (48 is best) if you have request for certain dishes. 8. They also cater for special events at the clients' prefered venue. 9. They make cake for Free if you reserve for 12 guests. 10. As for the accommodation, they have 2 rooms. The room on the ground floor can accommodate up to 4 and on the second floor, it can accommodate up to 8 friends and families who wish to stay overnight without the noise of the city. Chef Didier was Born in Paris France, but grew up in a small village where nature was generous with fresh produce, eggs, dairy and poultry. An apprenticeship in Pastry Arts in 1976 at the young age of 14 was the beginning of a long and fruitful career. The program consisted of working long hours at a nearby Pastry shop, while also attending classes at a school in the city of Versailles. School curriculum was more on theory, math, science. After graduating 3 years later, Chef Didier moved to the city of Nimes in the south of France, where he was employed as a commis for a prestigious Pastry, Chocolate and Ice cream shop. After returning to his home a year later he worked for 2 years in a large pastry and bakery facility supplying desserts and breads for hotels and restaurants. With a strong desire to travel and explore the world, Chef Didier applied and was accepted for his first Pastry Chef position in Studio City California, for a high end pastry shop, he was 20 years old. Once the contract ended, returning to France was difficult and when another opportunity presented itself to go back to the US, he did not hesitate. What was supposed to be a 1 year contract turned into 21 years living in America. Mostly working for 5 star hotels, from Detroit, Houston, to Washington D.C, his experience matured. It was in his last 10 years in the US, that while being Executive Pastry Chef, for the prestigious St Regis Hotel that he started developing his cooking skills. Nominated 5 years in a row as Pastry Chef of the Year by the Washington Restaurant association as well as many press reviews, TV interviews and shows, propelled him at the forefront alongside the local and national elite of celebrity Chefs. Often the Pastry Chef chosen for Charity dinners, as his course was the last he would spend time with the other Chefs, observes and absorbs their techniques. Surrounded by the best Chefs in America from all over the world, spending time by their sides was an amazing experience. After leaving the US in 2005, Chef Didier’s international experience grew with jobs in North Africa, the Middle East, where he met his wife Merna, and the Philippines. Chef Didier was hired as Executive Pastry Chef in the pre-opening stages of Raffles/Fairmont hotel in Makati. 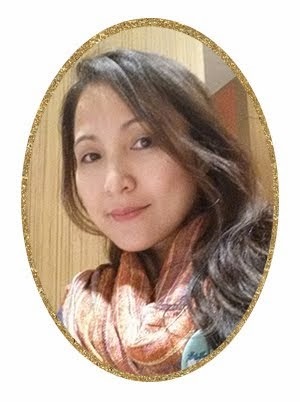 After a year of Sabbatical to help Merna open her business, Chef Didier was brought in to open Novotel Araneta Center. Sunday family lunch and dinner is particularly important for us, #Mendiolables, because its the day when we leave stress and worries out to bond and focus on what's important in life. 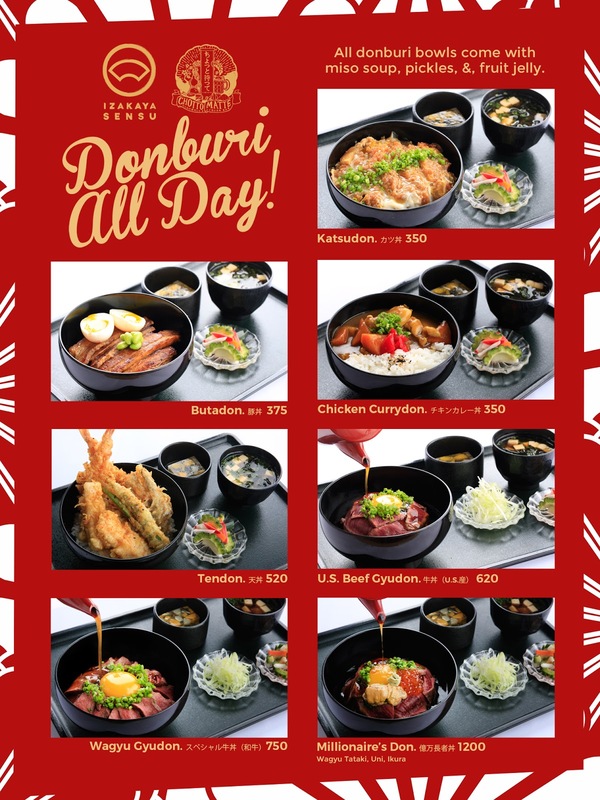 Last Sunday we headed at Izakaya Sensu in BGC to try their Don Buri All Day and other specialties like Daikon Salad with Sesame Cream Dressing, Kaisou Salad (3 seaweed salad with Ponzu vinaigrette), Omakase 7 (Bluefin tuna, Norwegian salmon, squid, horse mackerel, flounder, hamachi & our daily chef's selection), Hanjuku Tamago or Soft boiled eggs, Mango Orange Yakult Smoothie Frozen with condensada, Wasabi Watermelon Smoothie, Four in Season, Yuzu Citrus Mint Spritz, Sensu Iced Tea, Miso Chocolate Cake, Fluffy Matcha Chiffon Cake, Fluffy Matcha Chiffon Cake, Matcha Belgian White Chocolate Cheesecake. Izakaya Sensu is an informal Japanese-style gastropub that serves fresh sashimi and other traditional Japanese favorites. It shares the same space with Chotto Matte where you can enjoy fresh beats, cool cocktails and the best Kakubin highballs. Mothers are the most hardworking creature on earth so they deserve something really great. Why not give your mom, nanay, mudra, inay, Mother's Day Off Wellness Package at View Park Hotel. 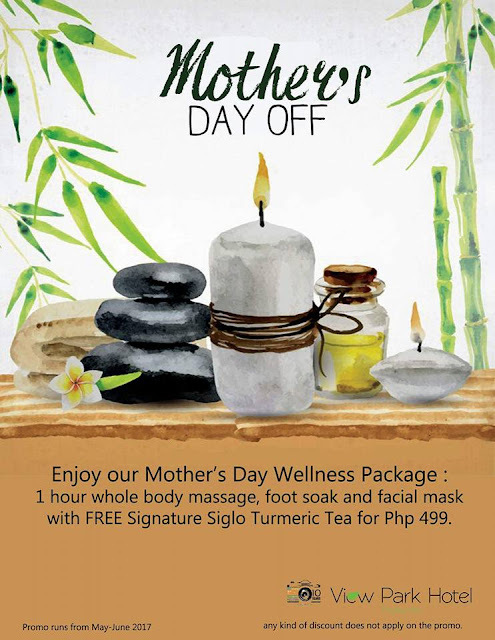 Here's what I suggest, give you mom a complete Mother's Day Off wellness package for Php 499 only where moms get 1 hour of whole body massage, foot soak and facial mask with FREE signature Siglo Turmeric Tea. 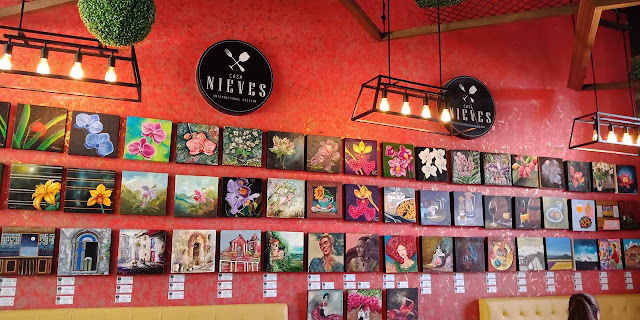 ARTipolo en Casa Nieves join hands in it's first ever Art Exhibit in Robinsons Place Antipolo to celebrate the colorful life of the late Nieves "Bebe" Lam Escobar-Rodriguez. As an inspiration to many, she was adored as a humble mother, businesswoman, beauty queen, cook, collector of artworks, pottery and wood sculptures, philanthropist, horticulturalist, writer, religious patron of the Virgins and Saints and a dedicated community worker. Through the ingenuity of @Artipolo and its Artists, the vision of Casa Nieves was fulfilled - we eat and feast with our eyes first. The Exhibit will run from April 21 up to May 21, 2018 and the artworks will perfectly fit the empty spaces of your workplaces and homes. These original and beautiful artworks are conversational pieces that are sure to capture and hold anyone's attention. The Paintings come in 12x12in canvas and are reasonably priced to be bought in pairs or in sets. For inquiries you may contact, 9971894/09175435931. Or visit www.artipologroup.com for the Artipolo en Casa Nieves Catalogue. 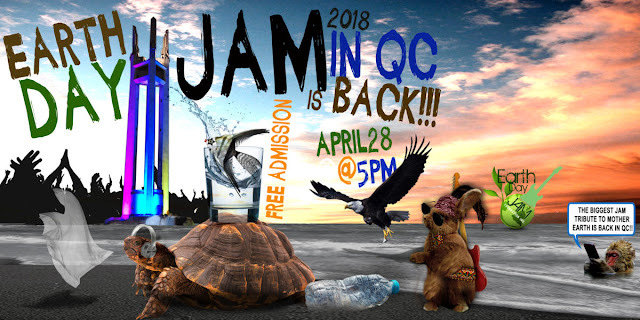 The longest running FREE Concert for Mother Earth is happening on on April 28, 5 p.m, at the Quezon City Memorial Circle. Eating Japanese food seldom happen for my family because my husband is not much on sushi and raw food. I frequent Japanese food only with my son Rafael because he loves anything from Japan. I'm happy that John enjoyed our Genki Sushi adventure in UP Town in Katipunan for its food and concept. He and the kids, had fun with the interactive ordering and the conveyor belt that served our orders. John also enjoyed the food especially the premium bento. We enjoyed the whole process at Genki Sushi - from the greetings of Genki Sushi staff, to making my own green tea and up to the serving of food via the conveyor belt. We, #Mendiolables, highly recommend this Japan-based chain restaurants for the whole family to enjoy. Kung ako na nanay nag enjoy, lalo na ang mga kids. I seldom get migraine but yesterday was a different story. 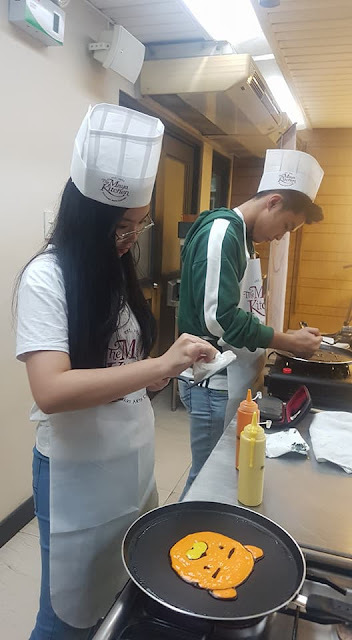 Despite that condition I didn't let it spoil my day and headed to The Maya Kitchen to meet and greet and learn the hotcake art from no other than The Pancake Warrior, Elle Jay Orbase himself! Elle Jay is not a chef nor a professional artist, but he enjoyed drawing cartoon characters in grade school. What started out as a curiosity over a hotcake griddle turned into a full-time career as he launched The Pancake Warrior YouTube Channel. His creations, ranging from logos to anime and cartoon characters, and even Philippine presidents, have become online sensations, garnering a total of 16 million views and fans from around the world. Elle Jay uses the Maya Original Fluffy n’ Tasty Hotcake Mix and the Maya Quick n’ Easy Hotcake Mix for his creations, and will be sharing special tips and tricks to help you perfect your hotcake art. Using a squeeze bottle filled with colored batter, he first outlines the shape onto a heated pan, then fills in the gaps with details to bring the characters to life. But even without the tools that he usually uses, he encourages families to infuse a little more fun and imagination with their hotcakes. 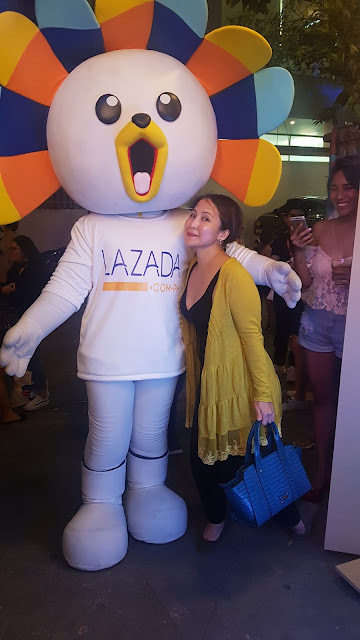 Lazada Philippines, the country’s largest e-commerce platform, celebrated its 6th BIRTHDAY today at The Ruins in Makati City with a cool party for media, bloggers, influencers and guests. To give everyone a night to remember, a two-minute shopping was the highlight of the night. I got what I wanted, a laptop/bed table and a lot of shampoo and conditioner (lol!). To give loyal Lazada clients a big thank you, there's an exciting annual birthday sale which is slated to happen from 25 to 27 April 2018. Be prepared to get blown away with big discounts on your favorite brands and many more! During this three-day sale, you’ll definitely be in for the win as this birthday blowout includes killer deals, massive discounts, unbeatable flash sales, and other amazing surprises. Have you found a great after school activity for your kids this summer? Sign your child up for our Summer cooking classes at The Maya Kitchen. Kids will learn to cook, grow and develop culinary skills safely while whipping up age-appropriate recipes into tasty meals. Your child will discover new and different ingredients and how to create wholesome meals. Plus, kids realize how helping in the kitchen at home is fun! 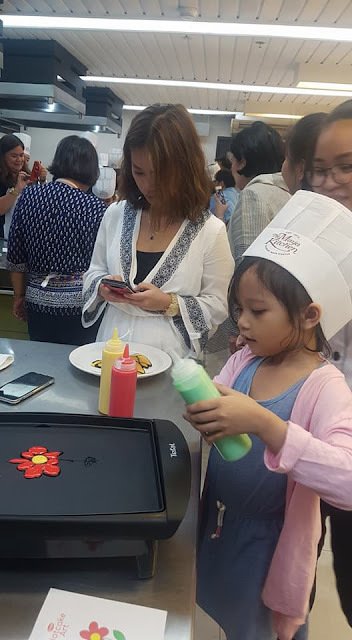 In The Maya Kitchen’s Kids Can Cook classes this summer, children try their hand at tasty culinary basics they’ll enjoy preparing as much as they’ll like digging into them. Classes for kids aged 6 to 12 years old will be held from May 15 to 18 and May 29 to June 1, 9 AM to 1 PM. This summer, steer your teenagers towards independence by signing them up for The Maya Kitchen’s Teens Summer Cooking Series. Over the course of four days, participants will learn how to whip up recipes perfect for sharing with their friends and the family. If your kids are between 13 to 18 years old, enroll them in the May 22 to 25 classes, 9 AM to 1 PM. Seven months of waiting for this Okada overnight is so worth it. That's how popular and busy this luxurious five-star hotel is. So if you plan to stay at Okada, make sure to book early for that special day or occasion. We liked the exquisitely spacious Deluxe Room that is overlooking the fountain. We were able to watched The Fountain show and recorded it at the comforts of the lovely room. The room has a space of 60 to 74 sqm, with beds with Sealy mattress. We were definitely spoiled with the elegance specially because of the bathroom that comes with jacuzzi that is made by Inax. Everything's soft touch. The toilet is automatic. We didn't have to worry about bidet handle that tangles. My kids had fun eating with over 21 dining options to choose from. We stayed a bit late at The Fountain because we ate non-stop starting from Starbucks; to French Baker, Chatime, Pink's, and capped the night at Tokyo Cheese Factory.Family with young kids who's into popular food chains didnt have to worry because you can have it delivered in Okada but guests must pick it at the lobby since Okada is very strict with security. That's even a plus factor, right? The room rate for De Luxe Room we stayed on starts at 14,000 up to 17,000, depending on the occupancy rate. The receptionist told me, it can even go as high as P22,000. I didn't have to worry about the rate because I won this overnight accommodation at an event I attended last year. For shopaholics mom (like me, lol! ), worry not because at Okada Manila, over 50 of the world’s leading brands are well represented in a retail space designed to make memorable experiences. Navigate the Crystal Corridor with a personal retail concierge to help you get the most of every purchase and shop to your heart’s content. The only thing we didn't like was the late check-in late, about 19 minutes, because the room was not ready. I think the receptionist forgot about us. Had I not reminded her, we would have stayed longer in the lobby. The Fountain at Okada Manila is a sight to behold. As expansive as 50 Olympic-size swimming pools, the US$30-million fountain’s grandeur and accurately choreographed water, light and music performances rival those in Dubai’s Burj Khalifa and Las Vegas’ Bellagio. Equipped with advanced underwater robots, more than two-thousand lights, dozens of high-fidelity speakers, and more than 700 high-power jets that can shoot water beyond the height of the Okada Manila hotel building. Fri to Sat, two consecutive shows at the top of each hour (6:00 PM to 12:00 AM). Graduation ball is one event in the lives of students that is mostly anticipated since the start of Grade 7. The graduation ball of Grade 12 students from City of Mandaluyong Science High School is a very special one because these students are the first batch of senior high graduates from K12 program. The event was held at The Great Eastern Hotel, formerly Aberdeen Court. Kuddos to all the parents committee and the teachers for helping the students have a fun night. Congratulations to all Grade 12 Batang Mandsci for graduating! I'm very happy to have attended Glade's event, Love By Glade, earlier today at Glorietta Activity Center in Makati. where they introduced Glade's new scent Peony and Berry Bliss. Complete with a dome where you can have peony tea and strawberry meringue, this event is the best smelling event I have covered in my 8 years of blogging! My family has always been Glade user, from scented gel for the car, scented oil for the house, aerosol spray, name it we have it. I'm happy that there's Glade Automatic Spray that automatically time-releases fragrance. The Glade Automatic Spray is a battery-operated unit that makes any room oh so fragrant for weeks. I suggest you go visit Glorietta tomorrow until Sunday and check out the Glade's event where you can smell Peony and Berry Bliss, get FREE golf umbrella, eco bag and GIF photo by buying Glade Automatic Spray Starter for only P570. Plus, you get to watch ballet performances and listen to violinist for FREE as well. When I was in elementary and high school I'd always look forward to closing party because everyone is in a relax and happy mood. It's also the official start of summer vacation. And most imporatantly, the food! I like eating a lot when I was young. I was actually a chubby, chubby (cute, shhhh, quiet, lol!) girl back then. I am the Homeroom Parents President so I facilitated an impromptu mini program for Julia's Alpha class. I asked Carl to do the thank you address for Mrs Ressurecion. Of coursr it wouldn't be complete without our dear teachers message for the kids and parents as well. Chow time is always a big hit which made everyone happy. I'm not an officer at my son Rafael's Gamma Class but I initiated the same mini program because our president, Riz, is in the office. She couldn't make it because she just started working in AFP. Everything went well for both sections, it's just that we are going to miss Ma'am Jaymee because she will be transferring to another this coming 2018-2019 school year. So long, Ms. Jaymee. Until we meet again! We love you!